Charles Eames, born 1907 in St. Louis, Missouri, studied architecture at Washington University in St. Louis and opened his own office together with Charles M. Gray in 1930. In 1935 he founded another architectural firm with Robert T. Walsh. After receiving a fellowship in 1938 from the Cranbrook Academy of Art, he moved to Michigan and assumed a teaching position in the design department the following year. In 1940, he and Eero Saarinen won first prize for their joint entry in the competition "Organic Design in Home Furnishings" organized by the New York Museum of Modern Art. During the same year, Eames became head of the department of industrial design at Cranbrook. Ray Eames, born Bernice Alexandra Kaiser, was born in Sacramento, California in 1912. She attended the May Friend Bennet School in Millbrook, New York, and continued her studies in painting under Hans Hofmann through 1937. During this year she exhibited her work in the first exhibition of the American Abstract Artists group at the Riverside Museum in New York. She matriculated at the Cranbrook Academy of Art in 1940. Charles and Ray Eames married in 1941 and moved to Los Angeles, where together they began experimenting with techniques for the three-dimensional moulding of plywood. The aim was to create comfortable chairs that were affordable. However, the war interrupted their work, and Charles and Ray turned instead to the design and development of leg splints made of plywood, which were manufactured in large quantities for the US Navy. In 1946, they exhibited their experimental furniture designs at MoMA. The Herman Miller Company in Zeeland, Michigan, subsequently began to produce Eames furniture. Charles and Ray participated in the 1948 'Low-Cost Furniture' competition at MoMA, and they built the Eames House in 1949 as their own private residence. In addition to their work in furniture design and architecture, they also regularly turned their hand to graphic design, photography, film and exhibition design. In 1957 Vitra signed a licence agreement with Herman Miller and began producing the Eameses' designs for Europe and the Middle East. Charles and Ray Eames have had a profound and lasting influence on Vitra. It was the encounter with their work that spurred the company's beginnings as a furniture manufacturer. Yet it is not just the products of Charles and Ray Eames that have left a mark on Vitra. Even today, their design philosophy continues to significantly shape the company's values, orientation and goals. 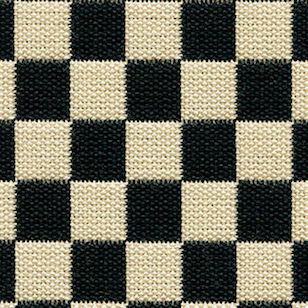 Alexander Girard developed the textile pattern 'Checker' in 1965 as part of his legendary redesign of the corporate image for Braniff International Airlines. The checkerboard design is a prime illustration of Girard's radical break from the conventional low-key aesthetic that characterised the sector at that time. The soft double weave fabric, with a high percentage of cotton, demonstrates exceptional purity of colour and its geometric pattern lends a striking note to any environment. Hopsak is an expressive, flat plain-weave fabric made of polyamide. The duotone colours offer a multitude of design possibilities in high-contrast, brightly hued or subtle combinations of warp and weft threads. Highly durable and robust, Hopsak can be used in private interiors as well as public areas. Hopsak is available in 28 colours. The DSW Eames Plastic chair – Dining Side chair Wood base – belongs to the Eames Plastic Chairs family by Charles and Ray Eames. By using molded polypropylene instead of the former fiberglass, brittle and polluting to produce, Vitra has improved its robustness, elasticity and comfort. The chair is available in three versions, using a same shell shape: the DSW with wooden base, the DSR with the Eiffel base and the DSX with a single tubular base.